We walked to the station, passing the carousel, stores with Christmas windows, Christmas lights in the streets, and then the beginnings of St. Anthony's Fair. Started as a market selling home-grown produce, the Fair has expanded until it is now somewhat out of control, with blocks and blocks of Roman arena, Nimes stalls selling mostly clothing, but also jewelry, kitchen gadgets, wind-up toys, and similar junk. We speculated that these street markets in the south of France might provide a way for the third-world immigrants to make a living: it's a cash economy, and they probably pay little taxes. Moreover, we have read that job opportunities for these "exclus" is limited. 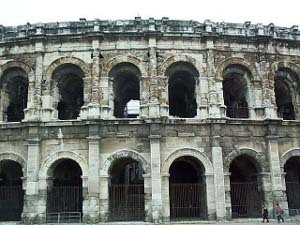 We hurried on and had a short train ride to Nimes, where we visited the Roman arena. 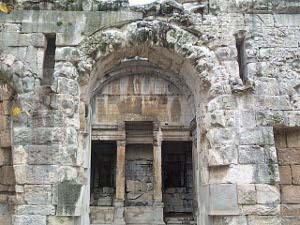 It was built in the first century AD, with seating for over 23,000 spectators. It's more impressive from the outside, as the interior of the arena has been modified for modern sports, spectacles (including bullfights), performances and ceremonies. A winter cover has been added, and grandstand seating installed. We clambered up and down while workmen readied the arena for the Curving interior corridor next event. We even noted the holes in the Roman stones in which wooden masts were placed to hold awnings to shade the more notable spectators. In Rome, the Coliseum is not suitable for modern events; too much has collapsed. 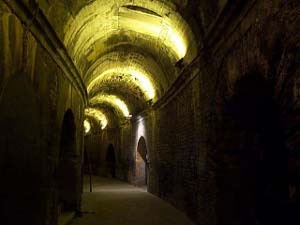 But the Coliseum is now preserved to show a lot of the subterranean rooms and passages used for ancient spectacles. 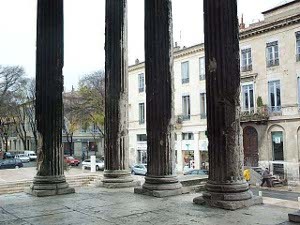 These cannot be seen in Nimes, but nevertheless, this is a most beautiful Roman building. 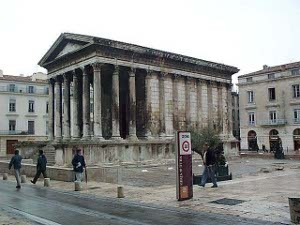 Nimes has more Roman treasures, and we walked through the modern city to the next sight: La Maison Carree, a classic Roman temple. 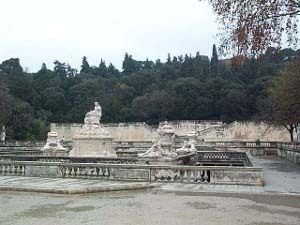 The building was dedicated to Augustus' grandsons and adopted sons, Caius and Lucius; it is not known what gods or goddesses were worshipped here. The Maison Carree is just as awe-inspiring as the Arena. It stands in the middle of a marble-covered courtyard high on its stone platform. We climbed La Maison Carree a flight of tall steps to reach the porch with its somewhat battered stone columns, then entered the temple itself -- a plain, high-ceilinged rectangular room. It was built about 3 to 5 A.D. Lots of archeological work has been done during the past several centuries. Thus it is known that the capitals atop the columns are limestone from quarries about 20 kilometers from Nimes, and a local scholar identified the missing letters of the dedication to Caesar's grandsons. In medieval times, the building was used for meetings, later as stables. From 1823 the temple housed the town's museum. Now it is preserved as it was in Roman times, and archaeological excavations in the surrounding squares provide more information about the Roman city. Our third stop was the Jardin de la Fontaine. This lovely and spacious garden was built around a natural spring in the 18th century. Trees, shrubs and lawns unfolded as we walked along a path lined with statues, up to a series of low stone bridges and an elaborate fountain, dry now. The site was known since Roman times; in fact, the Temple to Diana, its stonework fragile and unrestored, La Maison Carree columns dates from the first half of the second century. It is suspected that much more still lies below ground in an area which has never been explored by archeologists. As we cross the bridges, a family of ducks attracted us by diving, quacking, furiously flapping their wings and fluffing their feathers, and generally performing for us. We suspected they have learned to beg for bread this way, but we had no food to give them. We've never seen performing ducks before. Hoping that it would have a cafeteria, we stopped at the Beaux-Arts museum. It didn't, so we took a walk through the galleries. The kindest thing we can say is that there were a lot of paintings by lesser known artists. There were lots of city employees as guards and staffers. We thought they should sell Jardin de la Fontaine the paintings at auction, close the building, fire the staff, and use the money for a more worthwhile purpose. Not every city needs to have an art museum. For reasons which we failed to understand, the first class sections of our return train to Avignon were crowded; we sat facing a long-legged man and kept our knees tucked in for the short trip. We walked back to our hotel in Avignon through several blocks of St. Anthony's Fair, and remained unimpressed. It's true that there were stalls selling meats and cheeses, but our American conditioning prefers the hygienic atmosphere of supermarkets. But we should mention that we know, having visited Avignon by car two years ago, that there is a magnificent Auchan hypermarche about a mile outside the city walls. Apparently there are many such Temple of Diana super-supermarkets in France, but even today we are still agog when we remember that building, with over a hundred checkout counters, and absolutely everything imaginable within the walls. Increable! We've never seen a supermarket anywhere else in the world to compare with it. When we viewed these remarkable Roman buildings, with their truly beautiful proportions and graceful structure, and remembered that after the fall of the Roman empire there was no great European architecture for over a thousand years, until the construction of the great cathedrals, we wondered: Where would civilization be today if the artistic, literary, and scientific impetus of Greece and Rome had continued unabated!